Americans love parades. The streets are closed. Police officers, firemen and paramedics march behind bands to the cheers of the thousands lining the main streets. It’s fun. It’s chaotic. It’s congested. And if I don’t hurry up, I’m going to be an unwelcome part of this parade. I’m wearing a large black helmet and driving a tiny yellow buggy. I’m not sure exactly how it must look but I’m either Big Bird on wheels or the Yellow Wiggle rebelling against having to always drive a big red car. About 100m in front of me, the police are closing off the road. I accelerate. Nothing happens. I’ve already reached the buggy’s top speed. People point and smile and the police officer waits as my buggy escapes the parade into the streets of San Francisco. About 20 minutes earlier, I had arrived at a garage near Union Square to pick up the GoCar. 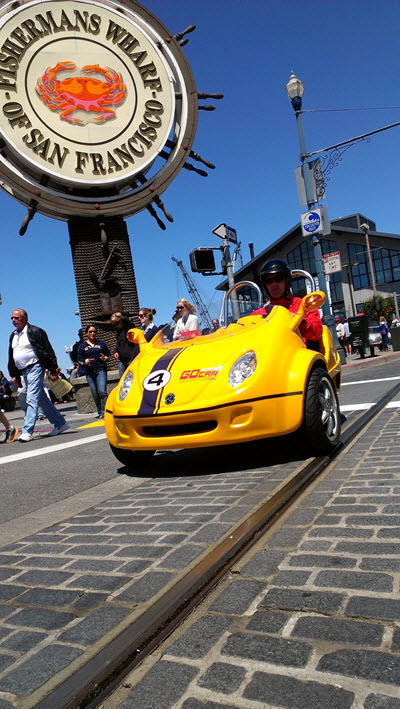 GoCars have been cruising San Francisco for just over two years. Two-seater buggies that offer GPS-guided tours, they’re a brilliant concept that is spreading to other cities. In fact, GoCars have franchise deals available in Australia. “Our CEO, Nathan Withrington, conceived the idea of a GPS-guided tour in 2003,” GoCars spokesman Alasdair Clements says. “We hired an engineer to write the software code. It was rudimentary at first, but it worked. Since we started the company, this software has evolved to become quite complex — a powerful tool to create a GPS-guided tour. GoCars are bright yellow with go-fast black stripes and racing numbers. I’m told they have a top speed of 50km/h, but that must be down a very steep hill. They have three wheels and a small boot in which you store your helmets when you park and go walkabout. And motorbike handlebars rather than a steering wheel. The tiny cars scream “Look at me!” — and everybody does. People point. People laugh. For the most part, fellow drivers are pleasant enough. Even the sometimes surly cable-car drivers are more than happy to yield to GoCars. There’s no need for maps. The GPS — a woman’s sultry voice — talks you through the city’s tourist high spots, telling you where, and when, to turn. After a brief safety talk and the obligatory signing of a form that basically says GoCars management is responsible for nothing, we head off. When you hire a GoCar, you can have it for the day. You can follow several predetermined routes, or turn off the GPS and go it alone. 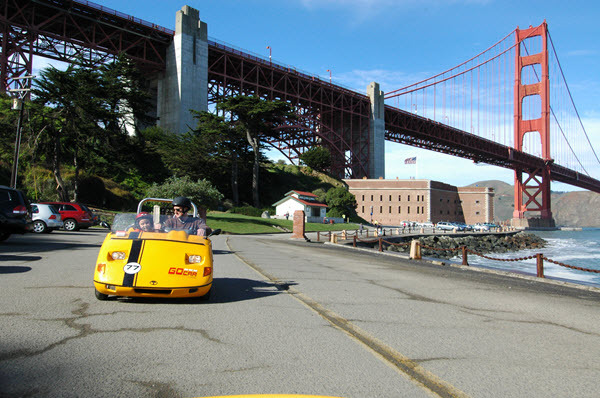 GoCar San Francisco underneath the famous Golden Gate Bridge. Image courtesy GoCar. There are only a few rules: don’t go on the interstate; don’t attempt to go over the Golden Gate Bridge; and, if the hill is too steep, be prepared to push. Oh, and there’s no reverse. I fire the engine by pushing a button and we chug off through the parade and head down towards breakfast at Fisherman’s Wharf. To be fair, San Francisco is an easy city to navigate, but it’s absolute child’s play when the car tells you what to do. As we make our way to the wharf area, the GPS points out buildings of historical value and promises that we will find the real San Francisco. But that will have to wait; it’s breakfast time. The car-park attendant motions us to a special parking spot just outside the Boudin Bakery. As we sit outside enjoying scrambled eggs served in a sourdough bowl, a crowd gathers around our GoCars. People can’t contain themselves. The cars are almost as much an attraction as Fisherman’s Wharf itself. Our appetites sated, we set off along the coast past Miami Vice star Don Johnson’s restaurant, past O. J. Simpson’s school and into the swanky part of San Francisco. It’s here that the GPS refuses to tell us exactly which house comic star Robin Williams lives in. I’m guessing it was the big one. Next stop, the Golden Gate Bridge. On this day, it was partly covered by San Francisco’s famous thick fog, but it’s always a great place to grab some happy snaps. We then made our way through Golden Gate Park, making stops at the flower conservatory, Japanese Tea Garden (you might recognise it from Memoirs Of A Geisha) and the De Young Museum before heading into the neighbourhood famous for the “Summer of Love”. GoCar San Francisco. Image courtesy GoCar. Haight-Ashbury is a great place to park the GoCar to eat and explore. It still has that hippie feel to it, but some of the sharp edges have been smoothed. By this time I’d become pretty comfortable behind the handlebars — until I turned the corner to head up the hill to the famous Lombard St.
Had I noticed the cable car, I would have let it go first. Too late. The cable car was getting larger in my side mirror. Ding, ding. Ding, ding. Who had right of way? I couldn’t remember. I gunned it, crouched down (as if that would help) and prayed that my little car would make it to the top. How embarrassing it would be if I had to push it up the hill with the cable car on my tail. Then I noticed that the cablecar driver was roaring with laughter. Ding, ding. Ding, ding. Just then the turn for Lombard St — San Francisco’s famous crooked street — appeared and I peeled off to the right. We were safe. About 10 minutes later we arrived back in the safety of Union Square. Tired and feeling slightly frazzled, and ready for a well-earned drink. 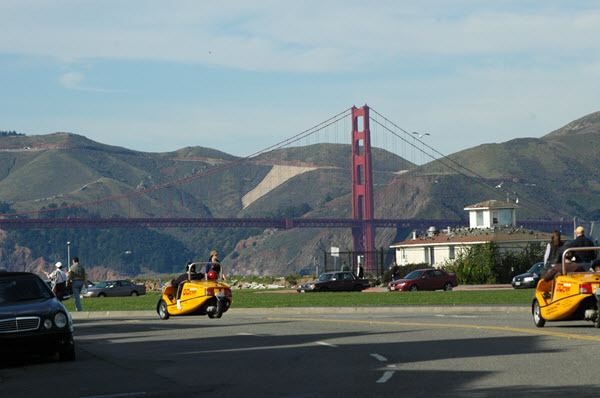 GoCar San Francisco tours are available year round from two locations – Fisherman’s Wharf and Union Square and start from $56 per hour for up to two people (prices correct at time of writing). Other locations include San Diego, Barcelona, Madrid and Lisbon.